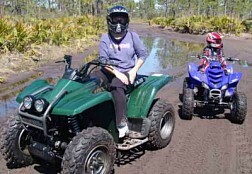 Help support Florida's #1 ATV website by becoming a Contributing Member. If you use this site on a regular basis and find it a valuable resource for finding places to ride and connecting with other Florida riders, show your support and contribute to the site. All it takes to become a Contributing Member is $20/year. Your support will help keep this site up and running and allow it to grow and continue to improve. If you would like to contribute more and become a Contributing Member Plus, you can do so by selecting the amount in the form below. Once your contribution is received your message forum account is upgraded to Contributing Member status for all to see (it appears under your screen name). Your screen name also appears in green in the 'Users Online' list to show you support this site. Contributing Member Plus users are shown in red. Plus, you will have access to the exclusive Contributing Members Only forum. A restricted access forum for members only. Contributing Members personal message storage is increased from 150 to 300. Plus members get 450. When the above is filled out, click button below. The above form subscribes you to a yearly recurring payment. You can cancel at anytime by using the link at the bottom of the page. If you don't like recurring payments, simply sign up, then come back here and cancel. You will still get a year of contributing status, but without the recurring payment. Want to cancel your subscription for any reason? Use the button below.